Hello, Before I get started, I would like to do a shout out to the folks who work in our. National parks. The lodgings are sub-contracted but from the people who handle our reservations to those who work the registration and the restaurant servers, every one does a terrific job. And the rangers who live in somewhat isolated areas and raise a family and clearly love what they do, I just want to hug them after a tour. Patient, knowledgeable, friendly, I cannot thank them enough for all they do. Mesa Verde is now in our top three parks of a growing list. It is located in the Sw corner of Colorado. Situated at @ 8200 feet, we have sweeping views from our room and throughout the park of the valley below and the distant Ute mountains. Like Chaco, the inhabitants first lived in pit houses, the pre-cursor to the kivas, and then went to pueblo style, with above ground linked rooms. 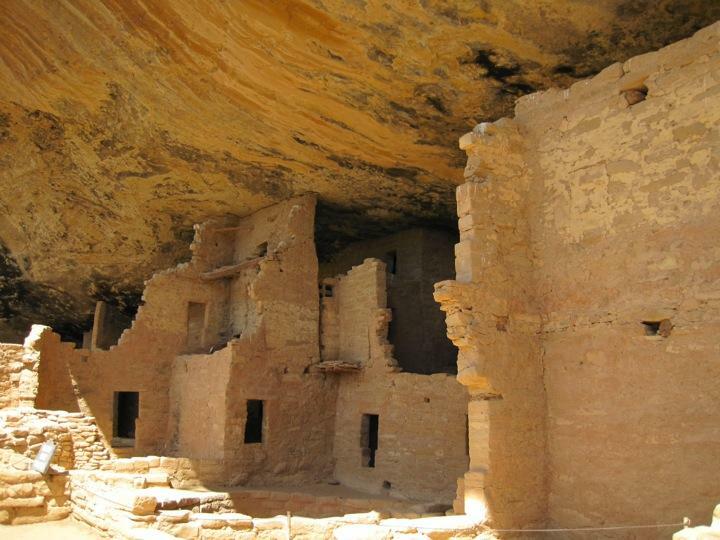 But those in Mesa Verde then moved into the caves in the mountains, using the over hangs as roofs and incorporated a mixture of stone and mortar to extend the rooms and create walls. Not sure why we found this system more engaging. Perhaps the broad scope of Chaco was not as "cozy" as these more intimate sites even with their views of the canyons hundreds of feet below. Sometimes called "primitives," these people carved out, literally, a very comfortable lifestyle in a very difficult climate. They cleverly used their limited resources to make medicine, food, jewelry and, of course, these phenomenal buildings. I was glad that I planned two nights here. The park is big and lots of area to cover. We visited two of the three major sites. To access Balconey House one needs to climb a 32 foot ladder and then crawl through a tunnel that is less than three feet tall. There are plenty of other things to see. Perhaps one of the best was the Sunset Temple. From across the canyon, we could see six different sites all within shouting distance and it is estimated that 600 people lived here at one time. It was a real neighborhood. In fact, during the Anasazi period, more people lived in this part of Colorado than live here now. We ended our day with a 2.5 mile hike that was not very well thought out. We decided to go at the last minute, then changed our route and I was the only one who brought water. We were all very relieved to climb out of the canyon with suffering too much from dehydration. In addition to not doing ourselves bodily harm, we finished on a high note. The food at the lodge is excellent, prickly pear turkey, pulled boar quesadillas, fresh Alaskan salmon, etc. We ended the day sipping wine on the Waldron's balconey and were visited by a mama deer and her twins both of our evenings. Also fortunate to just miss hitting a bear on our drive in. I am doing this blog on my IPad and it is a pain in the A****. It took over an hour to post ten pictures. I can do it so much better on my big computer when we get back to Santa Fe so check in again late next week for the remainder of our road trip. I can only hope that you take advantage of what this country has to offer. Our time out here has been extraordinary. David and Brenda Waldron What a concise and comprehensive record. Your immaculate attention to detail here, coupled with your detailed planning of this cultural crescendo was immaculate. Thank Miss Julie :) To Marty for his unselfish safe driving, stopping for photo shoots, and enthusing and guiding us through this wonderful natural world of majestic beauty. One of the most exhilarating experiences of our lifetime ! abby Are you going to Durango or just National Parks?